Not only vaporizes enemies, the steam also removes grease stains from the dining hall flagstones. A less-fortunate student at the Astral Academy, Nim finances the Academy fees by working as a cleaner before and after classes. The mysteriously masked caretaker is a taciturn mystery who prefers short conversations and solitude. 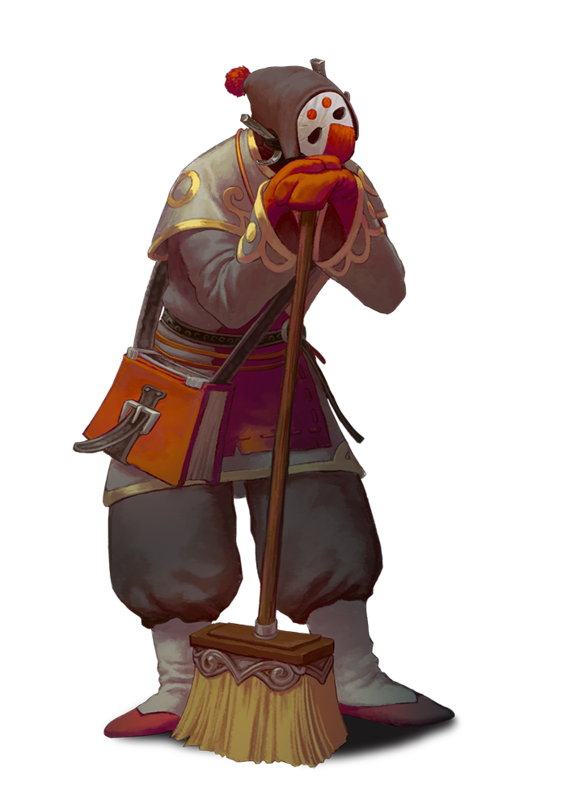 Nim is eager to collect the Nine Parchments, for a completed spellbook means a swift end to a life of servitude at the Astral Academy. It seems we'll quickly become friends, I enjoy short conversations and solitude as much as he does. I also expect one of those magical flying buckets as a companion. Can’t make promises about the bucket, but the broom is definitely one of my favourites, and fun times will be had with it! Good point, I hope you all had a nice holiday! So I’ve been playing nim on hard mode and now I’ve got a lightning circle around him. Is that from the squeaky clean skill? Yes, the yellow looking lighting circle is from that specific skill. It will activate immediately when you first time kill someone on the level.